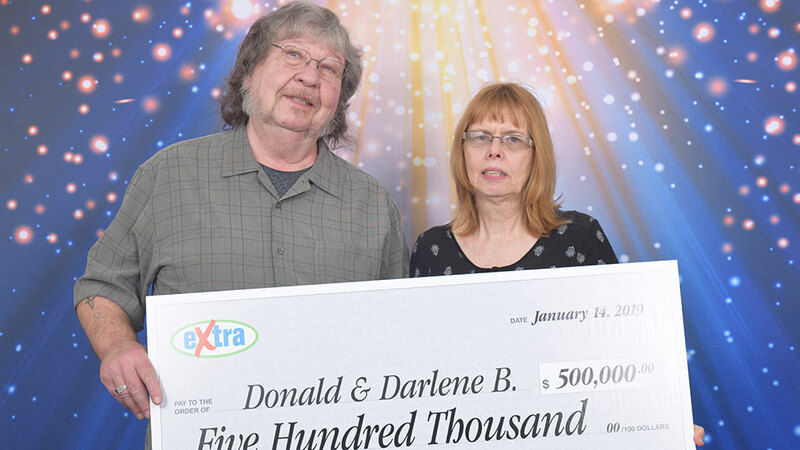 Don and his wife Darlene said ‘Yes’ to the Extra when they purchased a Lotto Max ticket and matched all four numbers in the December 22, 2018 draw to win the $500,000 prize. The Surrey retirees already have plans for their house. “We will definitely be fixing up our home, and while we’ve been to many places, a little more traveling can’t hurt,” said Don. British Columbians collected over $153 million in Lotto Max prizes in 2018. Anyone can win and #youcouldbenext. Watch some amazing lottery winner stories at www.playnow.com/lottery/winners/you-could-be-next. Lotto Max customers in B.C. have until 7:30 p.m. (PDT) on Friday evenings to purchase a ticket for that night’s draw. Visit PlayNow.com or lottery retailers across B.C. BCLC offers socially responsible gambling entertainment while generating income to benefit all British Columbians. Remember, play for fun, not to make money. For more information visit GameSense.com.